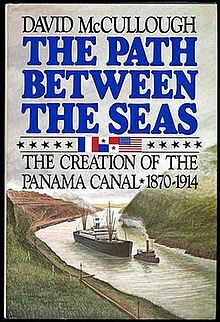 The Path Between the Seas: The Creation of the Panama Canal, 1870–1914 (1977) is a book by the American historian David McCullough, published by Simon & Schuster. The 698-page book contains 80 photographs, two maps and extensive source references. It won the U.S. National Book Award in History, the Francis Parkman Prize, the Samuel Eliot Morison Award, and the Cornelius Ryan Award. The book details people, places, and events involved in building the Panama Canal. The title refers to the connection between the Atlantic and Pacific oceans that the opening of the canal created. U.S. President Jimmy Carter has said that the treaties passing control of the Canal to Panama would not have passed the U.S Senate had it not been for McCullough's book. “All through the Senate debates on the issue,” McCullough observes, “the book was quoted again and again, and I’m pleased to say that it was quoted by both sides. Real history always cuts both ways." ^ McCullough, David (1977). The Path Between the Seas: The Creation of the Panama Canal, 1870—1914 (Octavo, 698 pages ed.). New York: Simon & Schuster. ISBN 0-671-22563-4. ^ McCullough, David (1977). The Path Between the Seas: The Creation of the Panama Canal, 1870—1914 (Paperback ed.). New York: Simon & Schuster. ISBN 0-671-24409-4. ^ "National Book Awards". National Book Foundation. 1978. Retrieved March 17, 2012. ^ "Francis Parkman Prize". Columbia.edu. Retrieved March 1, 2013. ^ a b "Samuel Eliot Morison Award 1978". American Heritage. 29 (6). October 1978. Retrieved December 23, 2017. ^ "The Cornelius Ryan Award 1977". opcofamerica.org. Retrieved 2013-03-01. The Path Between the Seas. Simon & Schuster. ISBN 9780743262132. Official website. This page was last edited on 25 April 2019, at 13:01 (UTC).